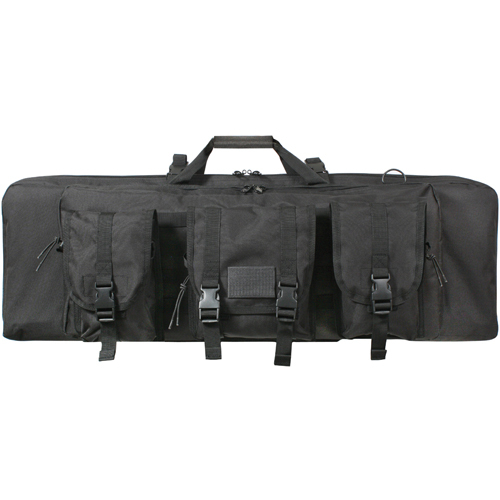 This rifle case comes with ¾ inch of padding for gear protection. The overall size of this black colored rifle case is 36 x 12 x 3 inches. This case has a long compartment which is 36 inches long. This compartment has 2 pockets to hold all the necessary accessories. This case contains 2 magazine pouches with the dimensions of 8 x 5 x 2.5 inches and an utility pouch with the dimensions of 8 x 8 x 2.5 inches. This case is excellent in quality and it protects your rifles safely. It also has enough room to keep all your essential items like gloves, batteries and magazines.